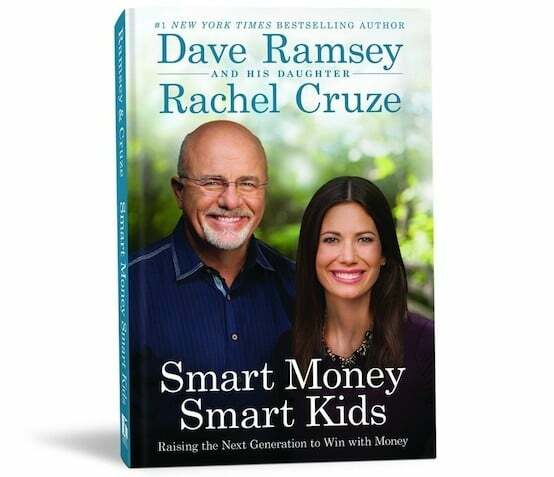 Because my husband and I created our family’s budget based on Dave Ramsey’s teachings, I have wondered what life was like for his children. MintLife: Why do you counsel parents that money is something you must teach your kids about just like you teach them to brush their teeth or get dressed or all the other normal parenting things? Cruze: Teaching your kids about money is a toolset that they have to have in life because you don’t really have an option as a parent. So being able to give them a strong foundation to go on their own, that’s just part of being an adult. MintLife: In the book you suggest a few very visual ways to help children learn about money, such as crumpling bills up to look bigger in their savings jars. Why do you feel that is especially helpful for children? Cruze: I think kids are just so visual so when they’re able to see something happening it clicks faster for them. That’s why I encourage parents to use cash versus – especially not a credit card – but even a debit card. You want your kids to see you use money and you can kind of explain where it comes from. They’re just very visual learners and they’re watching everything. You know, the theme throughout the book was “more is caught than taught” and so they’re watching your every move. The more you can just explain to them and show them, literally show them what you’re doing the more they’re going to learn. MintLife: What are the principles that you have added to the book that you might have formed by growing up in the Ramsey household, but have set you apart with your own message for people? Are there times you’re going to make sacrifices to get ahead? Absolutely. But there’s other times where you can enjoy your things. MintLife: Once you go through getting on a budget and being responsible with money it’s easy to be hard on yourself when you screw up. Cruze: I just think you have to go into this process to know you’re never going to be perfect, you just need to be intentional. So, it’s definitely a discipline that you have to have. Over time, I think it gets easier but you’re never going to be perfect. MintLife: It gets hard to keep saying to the kids, “It’s not in the budget. It’s not in the budget,” especially when they see what all their friends do and the things they have. Cruze: When you have to tell your kids “no” a lot it’s actually really a healthy thing because you’re teaching them boundaries. You’re teaching them limits, that money is finite, that once it’s gone it’s gone. But a big thing when they say “so and so has this and so and so has that,” the deeper issue is teaching your kids “don’t let your stuff identify you” because they are growing up in a culture with social media and reality TV where things are being thrown in their face 24/7. Being able to explain to them and walk them through this process of it’s okay to have nice stuff but don’t let your nice stuff own you, don’t let it have you. That’s where you can start talking about identity, you can start talking about contentment. Cruze: It’s a dangerous place to be, this idea of discontentment, if you’re never satisfied with where you are in life. Contentment is not laziness or lack of ambition – you still teach your kids to go out and win and be ambitious but it is kind of a spiritual exercise to be content. When you’re discontent it’s overwhelming, it’s addictive to just think that stuff is going to make you happy and it’s really a sad, empty life that a lot of people lead. That’s how they live. They’re playing that out all over the Internet and TV, so your kids are being faced with it, literally, every day. It’s probably the hardest for this generation coming up. They’re probably in one of the most difficult spots, I think, to combat materialism and discontentment because, again, everything’s so accessible and they can have anything when they want it because of iPhones and all the above. So, it’s teaching them to slow down and have patience to buy things and know that other stuff is not going to fulfill them. That’s a hard avenue and an uphill climb for a parent for sure. MintLife: What about the parents who pick up this book and get that horrible sinking feeling when they realize they’ve been doing it all wrong? Cruze: If they said, “I have no idea where to begin,” I think Total Money Makeover would be it because it walks you through all the baby steps and gets you on track. With parents that I’m meeting that are saying these things, I end it with encouragement always, to tell them no matter how bad you messed up with money I came from a family that filed bankruptcy. So no matter what mistakes you’ve made as a parent your kids are your do-over, they’re your clean slate and you can start this today no matter if you have a million dollars in debt or a million dollars in the bank. No matter where you are financially you can start today not only changing your own personal finances but also helping your children, and that’s what changes family trees. Editor’s note: This interview was edited for length.